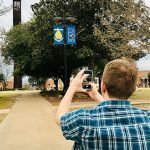 Five students have been named Social Media Ambassadors as part of an exciting new program showcasing student life at Southern Arkansas University. Hunter Byrd, Colby Clinton, Lindsey O’Neal, Dasha Pettis and Amy Thomas will be writing monthly blogs emphasizing specific aspects of their experiences at SAU. The blogs can be found on the SAU website at https://web.saumag.edu/social/. Byrd, a junior Business Administration: Marketing major from Fouke, Arkansas, said social media is an effective way to communicate with potential students about campus life at SAU. Byrd said he would like to one day professionally manage social media platforms for a large corporation. One idea he has for a blog will be to write about ways for students to prepare for early-morning classes. “Those can be tough, for sure,” he said. Clinton, a sophomore from Quitman, Arkansas, said he has always been interested in sports writing and will focus on that aspect of life at SAU. He is currently senior content creator for Rookie Road, an online sports-writing tutorial. Clinton also has experience making short films and documentaries. My readers will get an idea of what life is like when you come to college. O’Neal, a sophomore from Shongaloo, Louisiana, will blog about sports and student life, focusing on the different majors available at SAU. “My readers will get an idea of what life is like when you come to college,” she said. “The goal is to get students involved.” She plans to incorporate photography and videos into her blog site. Her first blog is called ‘Welcome Back, Muleriders.’ O’Neal is majoring in Mass Media. Pettis, a graduate assistant for SAU Communications and Marketing, earned her BA in Mass Communications in 2018. She will blog about campus life and student activities. Her undergraduate classes at SAU gave her the tools necessary to start a blog and develop her own style. “I’m glad to be part of something that is social, that will engage students on campus and in the community,” said Pettis. Her first blog entry is about her experience as a student sponsor on a recent ski trip to Colorado. She also wants to write about various community service projects and opportunities. “There are so many little things we do that people just don’t know,” she said. Thomas, a sophomore from Conway, looks forward to putting her own “personal touch” on informative blogs on a variety of topics. Thomas has a background in writing and will be highlighting ways for students to get involved on campus. The Ambassadors will use hashtags to differentiate their social media presences and direct visitors to their content.